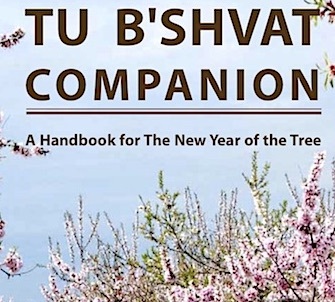 Tu BiShvat (“New Year of the Trees”), Jewish Arbor Day, is observed on the fifteenth (tu) of Sh’vat. Scholars believe that Tu BiShvat was originally an agricultural festival, marking the emergence of spring. After the destruction of the Temple in 70 A.C.E. this holiday was a way for Jews to symbolically bind themselves to their former homeland by eating foods that could be found in Israel. In the seventeenth century Kabbalists created a ritual for Tu BiShvat similar to the Passover seder. We eat an assortment of fruits and nuts, and drink several varieties of wine, that symbolize different seasons or ways of being in the world. How did the particular foods associated with the Tu Bishvat Seder arise? Deuteronomy 8:8 states that there are five fruits and two grains associated with the land of Israel: wheat, barley, vines, figs, pomegranates, olive trees, and honey (the honey referred to in this verse is date honey rather than bee honey). Almonds were also given a prominent place in Tu BiSh’vat meals because almond trees were believed to be the first to blossom in Israel. Today, we celebrate Tu BiShvat as a Jewish Earth Day: giving thanks for the abundance of the Eternal’s creation and acknowledging our responsibility to care for the earth. Judaism views Tu BiShvat as having the same meaning for trees as Rosh Hashanah has for humans—as a New Year and as a day of judgment. According to the tradition, on Tu BiShvat God decides how bountiful the fruits of the trees will be in the coming year. Tu BiShvat has also become a tree planting festival in Israel, where both Israelis and Jews around the world plant trees in honor or in memory of a loved one. Temple Beth Or hosts a Tu BiShvat Seder each year with an opportunity to sample symbolic foods with a learning/discussion. Check out our calendar for the date and time of our Tu Bishvat celebration.